Wow, this is going to be way shorter than most of my previous Billabong articles. Where’s the drama, the kind of hard to get your head around accounting, the recapitalizations and explanations thereof, the endless list of “significant items” I always complain about? Gone. Mostly. Well, not all the significant items. Billabong is implementing their plan and running their business. The watch word that ran through the conference call was “transparent” and the call and documents really were. We’ll get to the numbers. First, I want to show you and discuss a few quotes from CEO Neil Fiske. Long time readers know I’ve been recommending a focus on operating profit over sales growth (not specifically for Billabong) since sometime in 2008 when the Great Recession hit. You certainly leave the financial documents and conference call with the sense that Billabong has the chance to grow sales, but I suspect as they get more of their systems/supplier/logistics/ changes done, we’ll see efficiency improvement that will also help their bottom line. Speaking of that, here’s the link to the Billabong investor page. You can review all the documents from the half year report and see the conference call transcript and presentation. If you want to. If you don’t, at least open the transcript and start reading two thirds of the way down page five with the paragraph that starts “Ultimately.” Read about two pages from there and see what they are doing with their systems, suppliers, and logistics. What they are doing is really hard, really disruptive, really complex, and really necessary. Good for them. This is not just about buying some computers and software. That’s the easiest, though not easy, part. It’s aligning the people and processes to get the most out of those systems that’s hardest. Those processes include “…tighter integration between merchandising and sales and marketing in our go-to-market calendar…” Neil notes that they are “Going to market with a point of view about what’s important, what we stand for and what we want them [the retailers] to get behind. All things being equal, I’d expect these changes to offer opportunities to both increase revenue and cut costs as they come on line. Let’s start with the “as reported” numbers. All numbers are in Australian dollars. As we do that, keep in mind they sold West 49 in February 2014 and SurfStitch and Swell in September of the same year. We’ll look at the numbers without them in a bit. Revenue from continuing operations for the six months ended December 31, 2014 fell just slightly from $527.2 to $525.8 million. Gross margin rose from 44.8% to 45.2%. SG & A expense was down 1.85% from $217.2 to $203.2 million. The result was an operating profit from continuing operations of $12.5 million, a big improvement from a loss of $34.9 million in the pcp. Net profit was $25.7 million, up from a loss of $126.3 million in the pcp. $71.4 million of that improvement comes from a change in income tax expense and has nothing to do with how the business operated. Interest expense fell from $57.2 million to $16.2 million as a result of the restructuring. Discontinued operations contributed an after tax profit of $10.5 million compared to a loss of $23.1 million in the pcp. If you add up the changes in income taxes, interest expense and discontinued operations you’ll find that the improvement in net income as reported was only about $6 million excluding those items. It’s not quite as simple as that, but you can see what I mean. Obviously, there was a lot going on and Billabong has helped us to isolate that so we can see how the business is doing. You know what the discontinued operations represent. The “significant items” generated income of $13.5 million in the most recent period. They were an expense of $65.6 million in the pcp. They are restructuring costs, deal costs, inventory write downs, and a host of other stuff. See footnote 4 in the financial statements if you’re interested. We could have a long conversation about which of these should be included or excluded. Every company seems to have some new significant items or extraordinary events or one time charges pretty much every year. They have an impact on the bottom line. Some, I’m okay with excluding for the operating analysis. Others, not so much. Anyway, let’s just acknowledge that there’s a certain amount of art in this and move on. 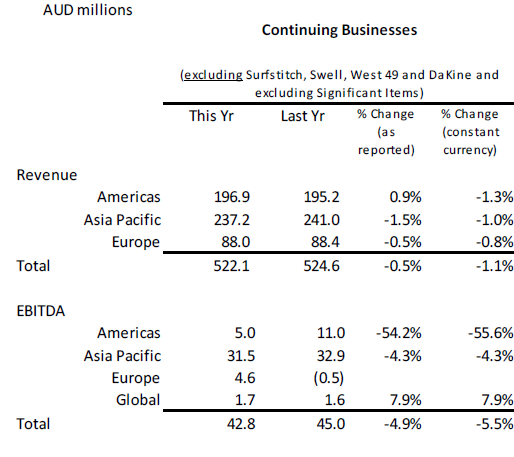 Below are the segment revenues and EDITDAs including the items and discontinued operations. Next, from the presentation during the call, here’s a breakdown of revenue and EBITDA by geographic segment that excluded the significant items and sold businesses. You can see that revenues fell slightly as did EBITDA. The gross margin for the continuing business was 54.9%, down from 55.4% in the pcp. Comparative store sales were down 3.5% in the Americas, but only 0.4% in the U.S. The number of stores fell from 173 to 68 mostly due to the sale of West 49. The good news in Europe is the strong performance of Element (we aren’t told exactly what that means) and the improvement in the gross margin from 49.4% to 55.9% after adjusting for the divestments. It was even a little better as reported. You can see the result above in the improved EBITDA. Neil says the improved margin was “…driven by better inventory control, improved merchant planning, margin management and a focus on higher quality distribution.” Comparative store sales were flat but store margins rose 1.7%. The number of stores, at 111, was down from 112 in the pcp. Asia Pacific suffered from soft Australian retail sales. It’s interesting that we still don’t hear much about their other brands. They do mention opening some Tiger Lily shops, but that’s it. I’d be curious to hear what’s going on with Sector 9 and Excel, among others. I still wouldn’t be surprised to see the sale of some other brands. The balance sheet has strengthened enough as a result of the recapitalization that I’m going to pay them the compliment of not spending much time on it. Non-current liabilities have fallen from $512 million a year ago to $268 million at the end of December 2014. Equity has risen from $194 million to $311 million. If I wanted to pick around the edges a little, I might ask why receivables were actually up a bit given the decline in revenue. Maybe because of the growth of the wholesale business. Cash flow from operations was a positive $13.7 million for the six months compared to a negative $27.3 million in the pcp. So “stabilizing,” the word Neil Fiske uses, is the right one to describe the continuing business. The profit turnaround is more about the taxes, interest and discontinued operations. However, a chunk of that represents benefits Billabong will continue to see- especially the interest expense reduction. The plan they are pursuing is the same one Neil announced when he took the CEO job, and it looks like they continue to move forward.